Our main mission is to develop technological solutions to help companies move to the circular economy in a profitable way. We have an online marketplace where companies are able to buy and sell waste, by-products and secondary raw materials via a secure, compliant, and simple process. Our main value prop is that companies who generate waste are able to cut costs and help the environment, while other companies reduce the need for new raw materials. 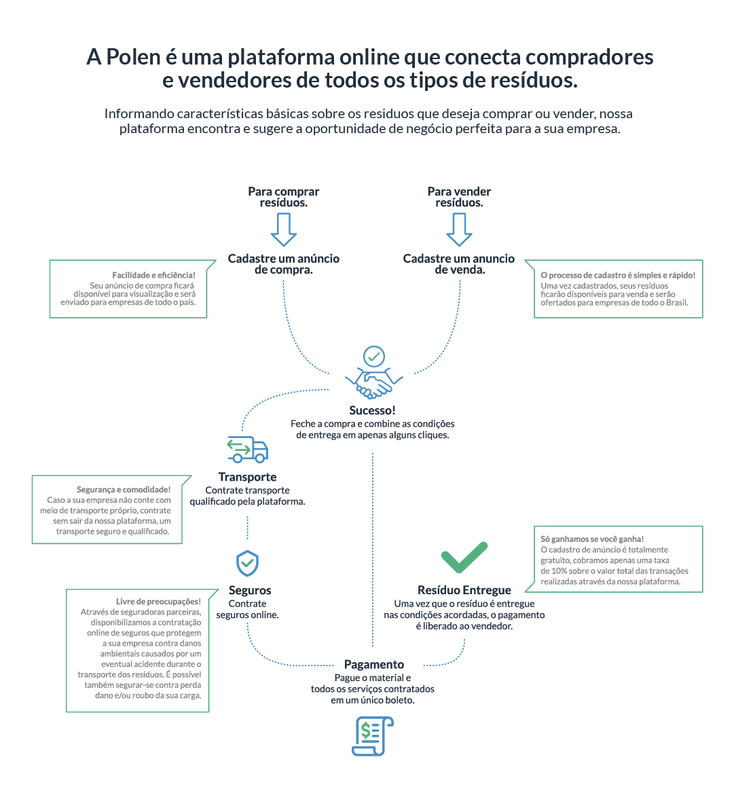 Polen is more than just a marketplace. The company also uses technology to replace a dated and malfunctioning system that Brazil requires many businesses to work within: packaged goods manufacturers based in Brazil need to provide evidence that 22% of the waste generated by the consumption of their products is recycled. This does not necessarily mean the companies themselves need to recycle that amount in their own production process, but that the companies must instead show evidence of total recycling achieving that amount. Unfortunately, the current system has a lot of vulnerabilities, and it is very hard for authorities to oversee and manage. To solve this challenge, Polen is hard at work on a blockchain-powered token that could replace these credits. According to Sarmento, a lot of companies and waste-pickers associations already collect, sort, and sell post-consumption waste to recycling companies. Polen would use blockchain technologies to track these transactions, allowing packaged goods manufacturers who buy them to prove that the materials are sourced from a responsible recycler. The blockchain system will create cryptographic tokens to prove that these companies are meeting the required evidence, sort of like a carbon credit, but for the reverse logistics of post-consumption waste. It’s a real breakthrough, it’s a perfect use case of the technology, and it adds value to the recycling chain as a whole. The idea behind Polen came from the founding team wanting to create more incentives to encourage environmental responsibility. In the past, businesses have sent useful materials to landfills, when these materials still have a market value. As an economist, Sarmento is focused on energy and efficiency. If you think about efficiency, there is nothing worse than throwing away valuable resources. This is a huge cost-savings for the waste producers. They spend a lot of money to bury money; so we took on the responsibility of helping them. When asked whether he was always interested in waste management and combating climate change, Sarmento’s answer was no. I initially worked at a construction company managing supply chain, and made a lot of connections in manufacturing. In talking to them, waste management is a huge problem. In my view, it’s not a problem, but an opportunity. These materials can be transformed into new revenue opportunities for these companies. That’s what made me get out of construction sector and jump at the opportunity to build something big and impactful like Polen.